Handmade quality vintage inspired boleros designed and made in the UK. 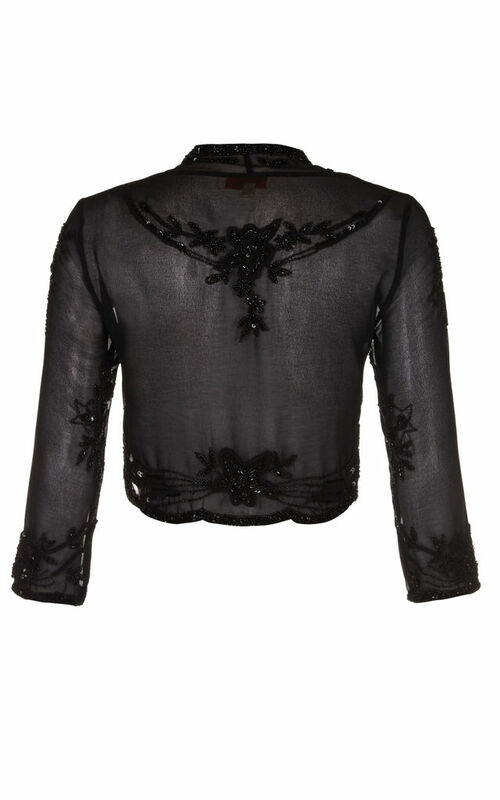 Boleros are made from UK Size 4 to UK Size 30 on many of our lines. Please note: This is not a costume bolero and is made for all occasion such as weddings and prom' not just for "Gatsby" themed parties. Headband and accessories on model are not included and can be purchased separately. Due to the nature of the fabrics reaction to light the colour may vary from studio images provided. Please contact us if your unsure of the colour or the size that will fit you the best. size UK6: Bust 33" Bicep 12" Length 15"
size UK8: Bust 35" Bicep 12 1/2" Length 15"
size UK10: Bust 37" Bicep 13" Length 15"
size UK12: Bust 39" Bicep 13 1/2" Length 16"
size UK14: Bust 41" Bicep 14" Length 16"
size UK16: Bust 43" Bicep 14 1/2" Length 16"
size UK18: Bust 45" Bicep 16" Length 17"
size UK20: Bust 47" Bicep 16 1/2" Length 17"
size UK22: Bust 49" Bicep 17" Length 18"
size UK24: Bust 51" Bicep 18" Length 18"
size UK26: Bust 53" Bicep 19" Length 19"
size UK28: Bust 55" Bicep 19 1/2" Length 19"
size UK30: Bust 57" Bicep 20" Length 19"